This is what happens when mommy tries to take a shower, leaving the girls to fend for themselves. Emma told me she was showing Mary her homework. I won’t even tell you the number of programs she had open when I finally sat down to see the damage. My father is probably cringing as he reads this! 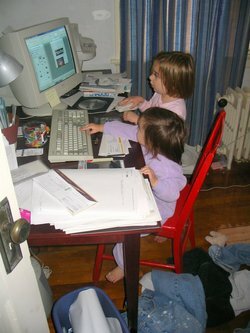 Maybe when we finally get rid of this beast of a computer it will become Emma’s "homework ‘puter". The last few days have been very busy. I didn’t even realize until yesterday evening that I completely forgot about self-portrait Tuesday. I hope to be back next week. The reason behind the busyness is that my mother is coming to town this evening for a visit. I have not seen her since Christmas so I am looking forward to it. I’m especially looking forward to her shock at how much the girls have changed since she saw them last. We have lots that we are trying to squeeze in–antique shopping, a quaint little restaurant I’ve been wanting an excuse to try, a visit to the art museum and a new knitting shop, movies and cups of tea….I’m looking forward to some time for all of us to be together. Oh, and another hat is up in my etsy shop. Then the next one I knit is a custom order. 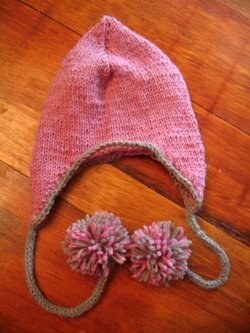 After that Emma is requesting some slippers and "just a set of pompoms" like the ends of the hats I make. Love that pink! Enjoy your mama. hope you have a fabulous time with your mom…! I know what that’s like, too– getting the house ready and all… it’s a special kind of cleaning, isn’t it…? oh, I miss my mom! the new hat is super-cute! I bet you are so excited to see your mom. Have a wonderful time. I had a great laugh when reading about your little girls making themselves busy while you were taking a shower! Do I know about that. Love the new hat, and the great pic of your “layered” daughter!